Using natural tinder for your fire making is always the preferred way to do it in order to practice your “tinder finding” and well as your “natural tinder using” skills, however if your wanting to focus on your fire making and take the variability of the quality of the tinder out of the equation using our tinder is a good way to do it. 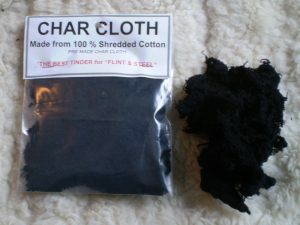 This 100% cotton is shredded so that when its made into char cloth there will be tiny fuzzy fibers on each thread that will seem to “reach out” and grab the sparks you make from your Flint and Steel set. 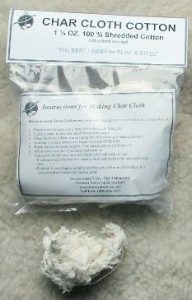 This is the cotton we use in all of our Survival Classes and we feel it is the best for teaching the skill of Flint and Steel fire making. Jute is a vegetable fiber that can be spun into string, cord or ropes but also is one of the best materials to use in practicing primitive fire starting. 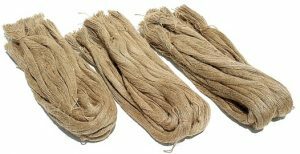 There are roils of Jute Twine that can be undo and pulled apart to make a tinder bundle or be used as tinder for fire making. When it is in this twine stat it can be easily wrapped around a knife sheath and carried as an emergency source of tinder. 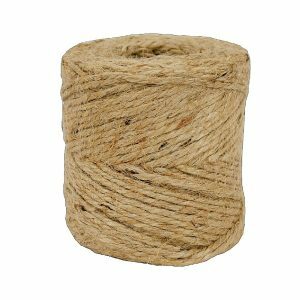 in the classroom, using jute tinder in twine form will simulate the time and effort you would need to take if you were to go out and look for natural tinder in the woods. If you want to skip the process of unwinding the Jute twine and shredding it up to make if fluffy our pre-shreded jute is what you should order. If your are purchasing this for your own personal use the 1 Gallon bag should be adequate for starting 20+ fires. 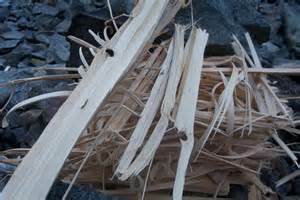 If your intending to teach a group of people fire making skills for Boy Scout Troops of classroom workshops the 5 lb box is the best value and will supply you with an adequate amount of this superb tinder. Tinder Fungus, or more properly Amadou (pronounced (am-ah-dew”) or Chaga (pronounced “chaw-ga”) is a fungus that grows mainly on Birch trees (especially White Birch). It is used as the fire starter (tinder) for Fire Pistons, or the material to catch a spark from a Flint & Steel set. Tinder Fungus akso has been used to carry a coal long distances by lighting the tinder fungus and allowing it to smoulder as it is being carried. On the Birch tree, the Tinder Fungus looks like a black bulbous “burnt bark”” growth on the side of the tree, but once it is broken off and the black outside crust is removed a yellowish-orange tinder fungus can be seen. It can be used right off the tree and does not have to be dried or prepared in any way. A 2 ounce quantity specifically for making tea is also available. 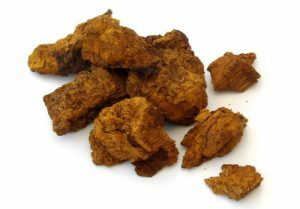 This is more dense and harder than the fire starting chaga and not suited for fire making.